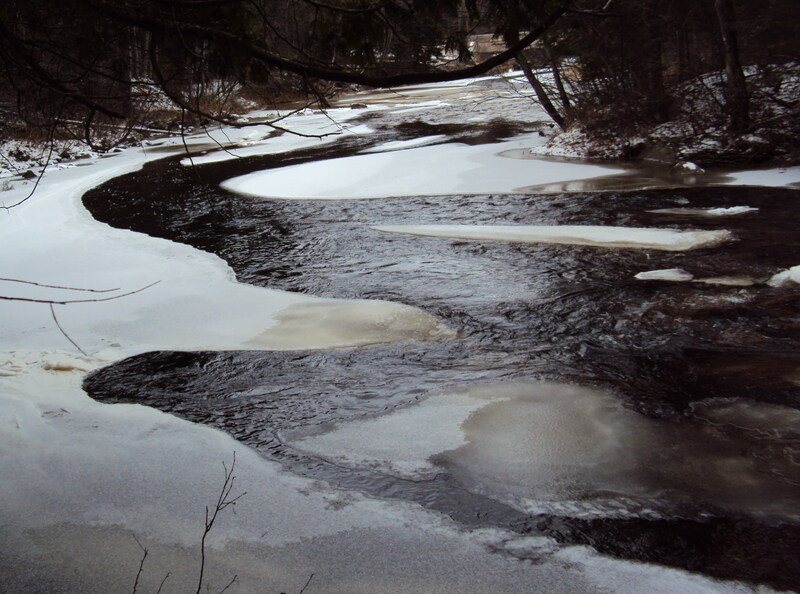 I don’t see much river ice – so these pictures are pretty cool. Once in my childhood I remember the Potomac River freezing solid. I was stupid enough to walk across it with my girlfriend Mary Beth. We were lucky, stupid and lucky. Oh, Dawn, I am glad you and Mary Beth made it safely across the Potomac. I think my daughter has a similar tale. 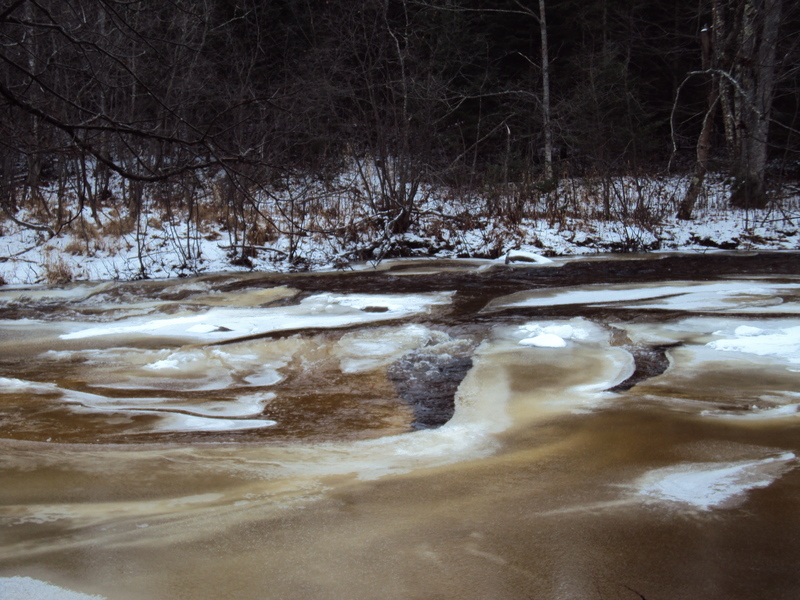 Not that we knew about it at the time… I wish that you could enjoy the river ice one of these days. Hmmm, I have never paid attention to river ice. And we do have some beautiful rivers around here as well. However, I am always fascinated by the frozen Lake Michigan. Iris, you’ll have to go out and survey the river ice near your house. It is bound to entertain you! Beautiful photos. Only 4 or 5 months? I seem to remember at least 6 months of winter! LOL! I always said winter snow wouldn’t be so bad if you could just stay in and watch it. Which is why I don’t think it would be so bad to retire in the north..no need to be at work early every morning! I also didn’t mind it when I could walk to work and dig the car out later. OK, Dawn, you’re right. Our winter IS really six months. I was being optimistic. 🙂 So, yes, you’ll have to plan to retire up here. That way you don’t have to worry about going to work early. I am hoping that school will be cancelled tomorrow so I won’t have to dig out the car in that blizzard. During the years we lived in Leland, Michigan, before a new garage blocked my view of the Leland (formerly Carp!) 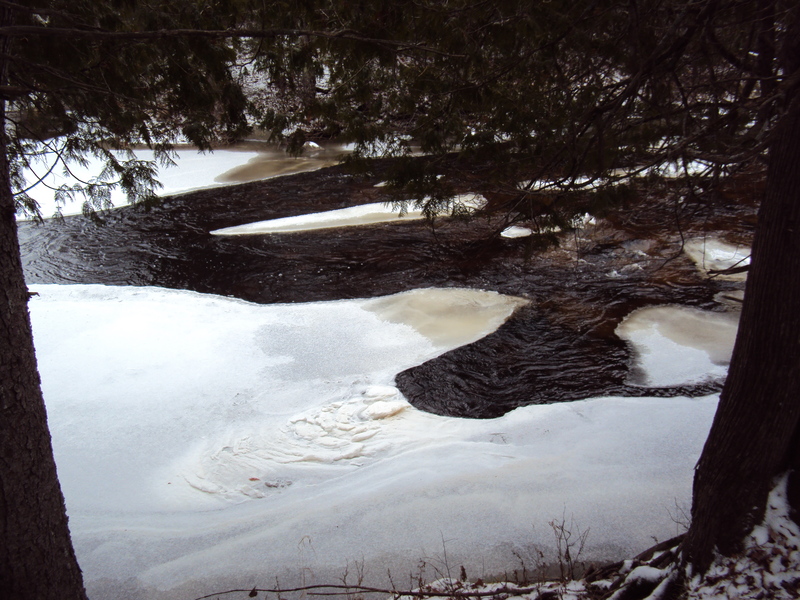 River, I was very aware of river ice–its forming, color and thickness, breakup in the spring. Your ice angel gave me a happy smile, Kathy. Thanks! We’re supposed to get a big snowfall tonight. Let’s all be very careful out there on the roads! Pamela, I am so glad someone liked the ice angel! Wasn’t it cool? 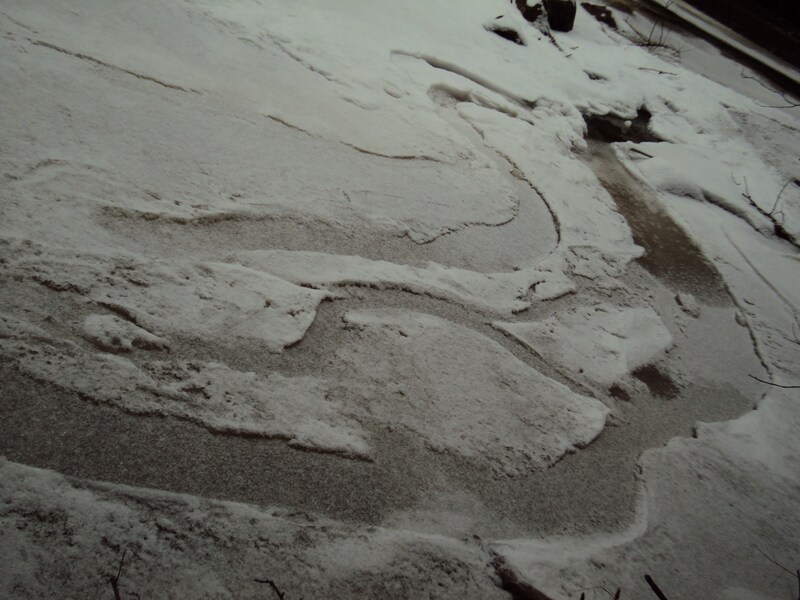 There was another picture, somewhere, of a woman’s figure in the ice. I am wishing you safe driving, as well, as this storm comes upon us. One of the things I love best about coming here is that you always remind me to slow down and look at the beauty around me! Cindy, bet YOU are hoping school is cancelled tomorrow! One of the best parts of writing this blog is that it reminds ME every day to slow down and look at the magnificent beauty around us. I think we all have to keep reminding each other. 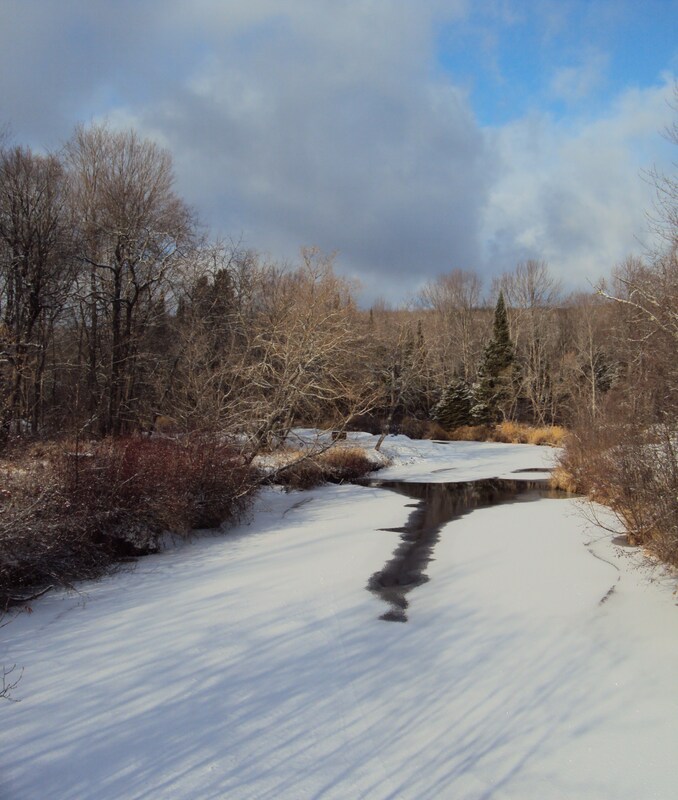 My brother & I walked across a frozen lake when we were in our early teens. Yes, very stupid. 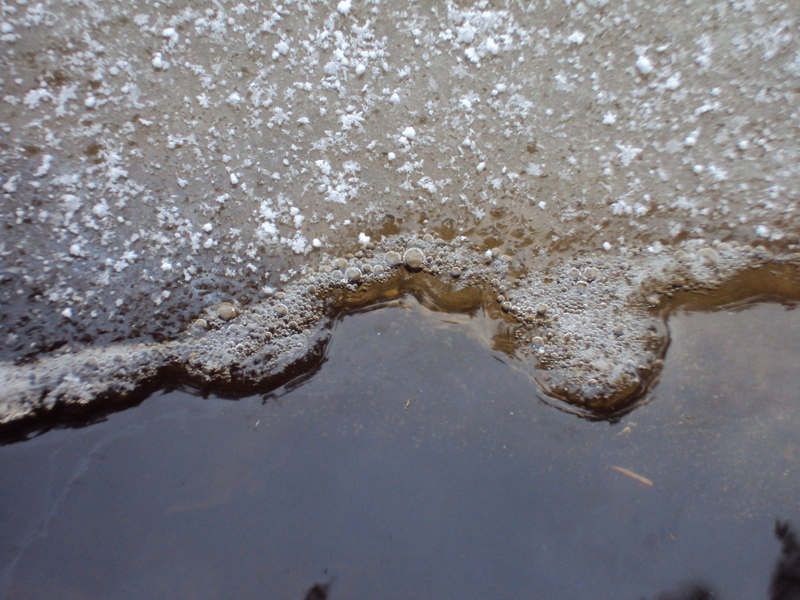 We good hear the ice cracking occasionally; luckily it held. Walking across the bridge this morning, the river was steaming from the cold and freezing more each day! It was -41 C here, at 8ish, with the wind chill. All I want to do is stay home!! Too bad I have to work all week and it’s not getting warmer. Hi gigi! Another ice-walking-survival story. I am happy you and your brother made it across! I wonder if this is a rite of passage that some teenagers have to go through. I am also sorry you have to work all week. When it’s….brrrrr….so darn cold! 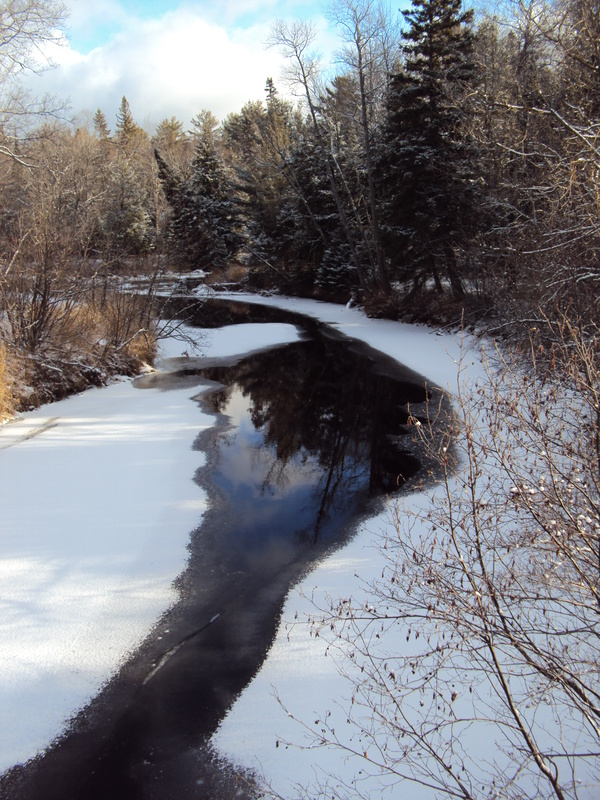 Ah, rivers in winter . . . time to plan another rafting trip on the Jordan! THE ICE PICTURES ARE INCREDIBLE! THE ANGEL ESPECIALLY. I THINK THERE IS A HIGHER BEING THAT KNOWS KATHY IS COMING FOR HER WALK AND GIVES HER THE INSIGHT TO SEE SO MUCH AND SHARE IT TO ALL OF US. Pretty!! OOOOO guess what?!?! That band of lake effect snow? Due to the very strong winds, it has extended over to my area of the state! About ten miles west of me has about a foot, we got about 4 inches. Very nice ‘first’ snow, thick and puffy blankets of wonder! oops!! face turning brilliant shades of red now…. i toooooooooooold you before I think I need an editor! I meant standing out in the frigid cold at all….still giggling here….